I could have titled this post “Weight Lifting” or “Strength Training” or even “Body Building”. But I knew that in doing so, I’d lose most (if not all) of you. That you would skip to the next post, figuring that this wasn’t for you. You’d probably think of those body builders with 0.2% body fat and muscles you didn’t even know existed. Or the mom who posted pictures of herself lifting ridiculously heavy weights at 8.5 months pregnant. I can assure you that I’m not any of those things. I do go to the gym, but I’m the one who looks like a mom of three, wearing old shorts and t-shirts, and sneakers from two seasons ago. Often I’m wearing a baseball cap because I haven’t washed my hair, and it has the added bonus of preventing anyone from making eye contact with me. I have my earphones in and I’m not the least bit interested in socializing. I’m there to exercise in the hopes that those endorphins will help keep my depression at bay. Some days, dragging myself to the gym might be the only positive, proactive thing I’m able to do for myself. I do the cardio workout but I really have to push myself to finish it. It’s the weights that I enjoy the most – really, the weights are what get me to the gym. I don’t do the free weights because I’m intimidated by them – and the people over there using them. I can’t very well stand there with my magazine article showing the 3 best exercises to get your arms ready for sleeveless dress season. So I stick to the machines – where I can discreetly figure out which setting I should use, and no one can really see how much weight I’m lifting. I’m afraid of the real gym rats judging me for being wimpy with the weights. It’s odd that I don’t judge myself when I’m using the weights. I have a very vocal (that’s a nice word for it) inner critic that shares its opinions on pretty much everything. I should have a better system for laundry; I should volunteer for more of the class parties at school; I should have enrolled my kids in swim lessons already. So it seems perfectly natural that my inner critic would speak up to criticize my weight-lifting – that I’ve had to reduce the weights because I’ve been slacking off, or I haven’t increased the weights in a long time, or I should be doing more reps. These things would fit in perfectly with the rest of my inner critic’s narrative – and yet it’s silent when I’m doing my weights. I don’t know what it is about the weights that shuts it up so well – but I wish I could understand it and apply it to the rest of my life. When I’m finished doing the weights, even if it’s only a short pass through the machines, I feel STRONG. Not because I’m using heavy weights at all, but simply because I have engaged my muscles in a focused way. It doesn’t matter whether it’s 10 pounds or 100 pounds. It’s a strength that manifests itself in my demeanor. I walk taller and carry myself differently. My husband has always maintained that he can tell from the tone of my voice when I’ve been to the gym. My whole being feels different. I’d be hard pressed to come up with any other instance when I really feel aware – and proud – of my own strength. I’ve always struggled with low self-esteem and a poor sense of self, and my depression certainly doesn’t make me feel strong…yet. I think someday, in an ideal world, I will find some beautiful inner strength in my depression – but at this point that’s only a pithy quote on a plaque somewhere. I’m so far from being in that place of acceptance that I can’t even fathom it. In the meantime, though, I can go to the gym and do my thing. Baseball cap, ratty gym clothes, and all. I can exercise my arms, and my legs, and my core. And I can enjoy, for a short while at least, the feeling of being strong. I’d love to end the post here with its talk of strength and positivity. 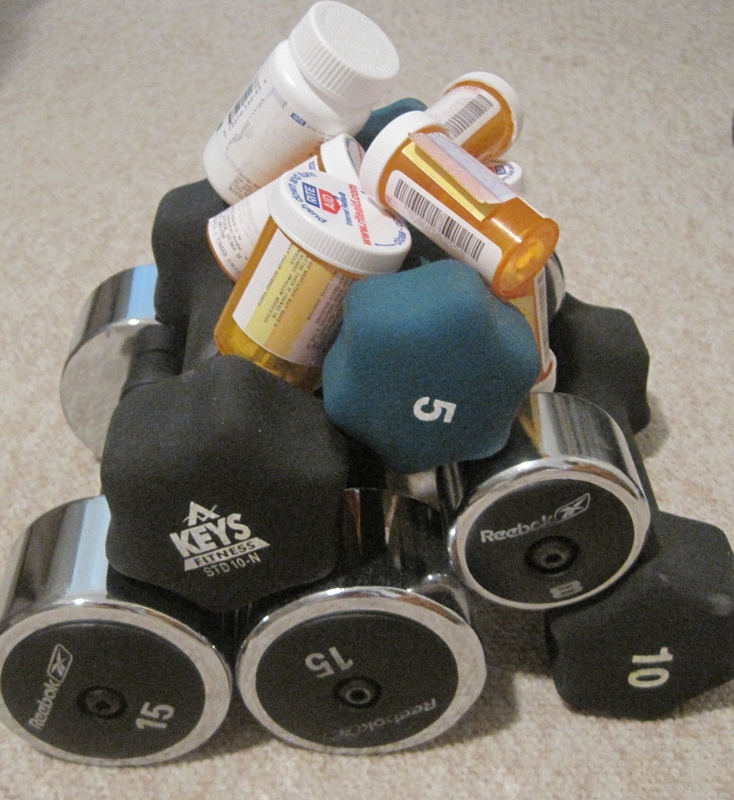 The postscript, of course, is that weight training doesn’t eliminate my depression. It doesn’t carry me through a whole month or even a whole day. In fact, when I’m deep in the hole and I manage to drag myself to do the weights, the resulting feeling of strength might only last for an hour. But you know what? That’s an hour that I could have spent feeling rotten about myself, feeling that my depression has beaten me down and made me a victim. So even though weights aren’t a magic fix, and my arms are never ready for sleeveless dress season, weight training gives me a reprieve from the pain of depression. And for that I’m grateful. I now have the lovely image of you going about daily life, pushing a shopping trolley, doing the laundry etc one handed whilst simultatneously doing bicep curls with a weight in the other hand to keep the inner critic at bay. Fingers crossed you find a more practical and socially acceptable way. You go girl! Lift those weights!